COPACABANA will be more than a party. This year's sizzling summer night celebrates Cleveland Play House with music, dance and romance, fanned by tropical breezes in a classic nightclub atmosphere. With an undercurrent of Latin rhythm. Cleveland Play House has served our community since 1915 through plays and education programs of the highest standards. COPACABANA celebrates this service and it also celebrates you, our most valued supporters. Your continued faith in CPH makes it possible for us to produce the sterling work on our stages while serving Northeast Ohio through superior education programs. 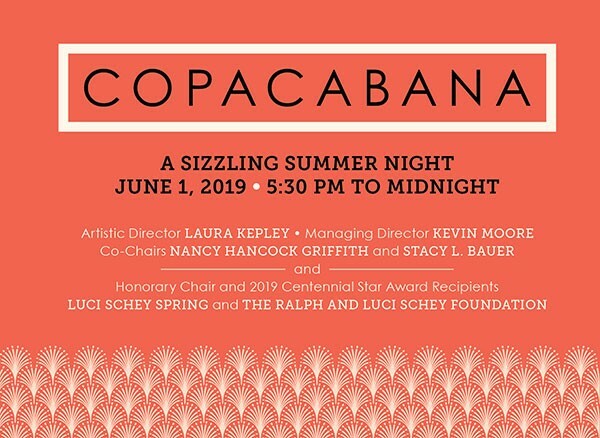 Your support of COPACABANA will provide vital resources necessary to maintain the artistic and educational programming our community enjoys year after year. CPH's annual benefit has been named one of Current's Best Black-Tie Benefits for the past 3 years. Don't miss this year's spectacular event! Reserve your place at COPACABANA now by Joining the Party. Corporate sponsorship inquiries should be directed to Geoff Masten at 216.400.7037 or gmasten@clevelandplayhouse.com. For all other questions, contact Beverly Gans at 216.400.7030 or bgans@clevelandplayhouse.com.